There is nothing more likely to make me balk with horror than anything fitting the description of “English heritage cinema.” I think of all of those horrifying Merchant-Ivory productions which wistfully yearned for a glorious, happy period of imperial dominance which clearly never existed in the real world. For many, the antidote to that particular cinematic poison has been the work of director Terence Davies who, beginning with his Trilogy (1976-83), and later with the masterful Distant Voices, Still Lives (1988) and The Long Day Closes (1992), painstakingly portrayed elements of his own personal experiences of growing up in a post-war and post-Empire England with unflinching honesty. Though at times sentimental for the lost days of his childhood, there is also a focus on ever-present forces of repression, whether they be in the form of organized religion, paternal domestic violence, or societal suppression of the director’s own homosexuality. What is continually disappointing is that funding for Davies’ films has been hard to come by, and so his output has been rather meagre; just four features in twenty years gives even Terence Malick a run for his money. A new Terence Davies film, in whatever form it takes, is therefore an event which needs to be celebrated in itself. Of Time and the City in appearance looks like a documentary about Liverpool. Book-ended with grand shots of the modern-day city, the majority in between is composed of found footage mostly of the kind of working-class neighbourhood where Davies grew up, as well as images of the city’s proud but dwindling industrial past. As the film marches on, time does too, and we move away from the grainy black-and-white images of Austerity Britain, past the Korean War and the Coronation towards the Sixties and the Beatles, from red-brick housing terraces to grim, menacing tower blocks, and from the director’s childhood to his adulthood and self-discovery. However, those expecting a balanced look at the city’s history should be warned that they will be disappointed: for example, the footage of the Beatles, surely a key focus of any examination of twentieth century Liverpool, is brief, with the narration dismissing them as looking like “a firm of provincial solicitors”. This is a highly subjective, personal piece of work, in many ways much more about the director than the city of the film’s title. His similarly fierce opinions on such matters as the Church, the monarchy, Empire, modern architecture and indeed most anything else modern, smack of curmudgeonly belligerence, and there is a danger with this sort of material of slipping into a kind of Philip Larkin-esque misanthropy. Yet there is also something alluring about this rebelliousness, an anti-establishment stance seemingly at odds with nostalgia, which raises some of the contradictions of what true Englishness, or Britishness, constitutes. Davies himself supplies the narration, and his extraordinary voice dominates the proceedings: a rich, well-spoken baritone (which some have backhandedly compared to Richard Griffiths’ Uncle Monty in Withnail and I (1986)) which guides us through his memories like a kindly grandfather offering a child some Werther’s Originals. It is something of an acquired taste, but it is impossible for me to imagine anyone else delivering anywhere near as affectingly the words of his remarkable script: weaving quotation, poetry, and experience, by turns full of warmth and radiant recollection, sombre and sober self-examination, and peppered with his trademark razor-sharp wit. I don’t think I have laughed so much with a film this year. In the hands of a less confident, less intelligent, or less talented director, this would be faintly forgettable Sunday afternoon television documentary fare. 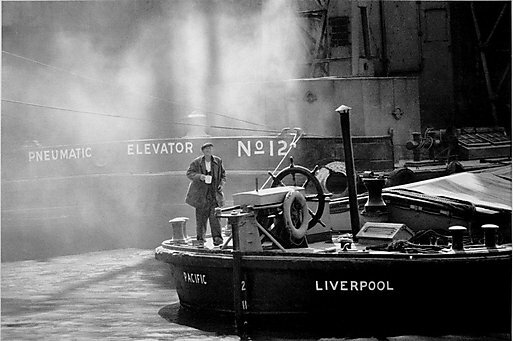 But Terence Davies is much more than that, and Of Time and the City is much more than just misty-eyed nostalgia. It is informed as much by both sadness and rage at the betrayal of a great industrial city, and by extension the working classes in general, by those forces which claimed to be working for the common good: the Church, the monarchy, and more subtly, the State. The film is about his own fall from grace, but also a country’s; in a time when there is a national debate in the UK media about the breakdown of society and communities, the film’s juxtaposition of footage old and new makes clear the director’s personal feelings on the matter. Those who love Terence Davies will love this film, but equally his detractors are likely to have their doubts reconfirmed. To my mind, he is a national treasure, a cinematic equivalent of Morrissey, another product of the industrial North-West, and someone who who at his peak covered similar thematic ground with as much intellect, dry wit, and maybe just a little despair. Trying to recommend to get someone to watch a Terence Davies film is like trying to get someone to listen to The Smiths for the first time — it is nigh-on impossible to explain his films’ strange magic, but one must try regardless.